CHESTER, VERMONT – When a specialty food company’s motto is “Chef created, Nature inspired,” you just know that it’s going to taste good… and Drew’s All Natural products not only taste good, but they are also good for you. Of course, this writer knows first-hand, having had the pleasure of tasting these delicious, all-natural salsas and dressings on several occasions and believe me, the taster will not be disappointed. So how exactly did Chef Starkweather find his way down the path of creating these all-natural food products? Well, for starters, Drew has been working in restaurants since he was 12-years-old, so that alone tells you the man has a lot of experience with food from a young age. For the next decade-plus, he worked his way up through the ranks and eventually found himself as head chef at the prestigious Deerfield Inn, located in the heart of Historic Deerfield, Massachusetts. It was during his time at the Deerfield Inn that Drew’s homemade salad dressings began to garner attention from the local patrons and in fact, he started getting requests from customers to actually buy bottles to bring home. It was at this point that Drew realized he might be on to something with his creations and using his “chef created and nature inspired’ philosophy from the get-go, established his company and began hand-producing, packing and labeling the first bottles of salad dressing and marinades from his own kitchen. About a year after creating those first batches, a natural food distributer picked up Chef Drew’s products and before long, Drew’s All Natural was available in hundreds of stores throughout the Northeast. The combination of innovative flavors and all-natural ingredients was a hit, so much so that Drew’s grew beyond its production capacity and a new production plant was eventually launched in scenic Chester, Vermont. The new, state-of-the-art facility increased the company’s overall production by 800 percent and the additional output was necessary with the new distribution deal. 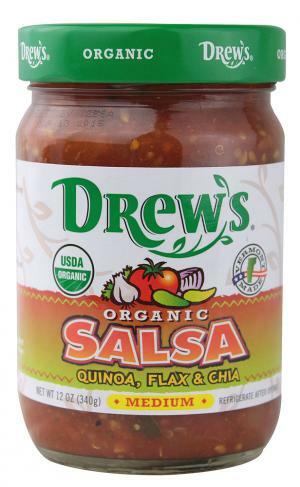 Another big step for Drew’s was achieving “organic certification” for its production in 2001 and that same year, they introduced a new line of all-natural (mild, medium and hot) salsas. Just two years later, their salsas were granted USDA Certified Organic as they introduced a fourth salsa flavor with “Double Roasted Salsa.” The Double Roasted was introduced at the Natural Products Expo East and received a coveted “Taste of Expo” award. Drew’s was given a “Good Manufacturing Practices” award by the prestigious NSF International (a health and safety assessment company) and in January 2011, took their quality management systems to an even higher level with the achievement of SQF (Level 2) certification. This “Safe Quality Food” system ensures an adherence to the best, scientifically-based accepted practices in the food industry. This highest level of quality, a proud accomplishment, was obtained through a lot of hard work, facility improvements and employee training. Along with their obvious strong business practices Drew’s is also a pillar in the community, often donating their time and efforts for local causes and supporting community involvement throughout New England. A few recent sponsorships include the annual Strolling of the Heifers in Brattleboro, Vermont, the 20th Annual Boston Earth Festival and 2013 Boston MixFest, as well as a recent Massachusetts Conference for Women. Drew’s also supports the local music and arts community and is currently sponsoring local shows for native-New England musician Randy Smith, who is currently touring with his Band of Merry Men. "Merry Men bassist Roy Brown is our Warehouse Supervisor and is a long-time Drew’s team member," Drew's General Manager, David Hambright, said in a recent Standing Room Only interview. "He has been active in a variety of musical projects over the years and is currently performing with Randy Smith and his Band of Merry Men. "Roy gave me a copy of Randy's Bittersweet CD and I realized he was playing some really good stuff! He then approached me with the idea of having Drew’s Organic Salsas available for people to taste and enjoy during performances and I thought it was a great concept. What goes together better than smooth music and tasty food? We are thrilled to have the opportunity to support our own Roy Brown and friend Randy Smith in their musical endeavors while giving folks in New England an opportunity to sample our organic salsas." Randy Smith: "We've had the good fortune to team up with Dave and the gang at Drew's to help promote their brand through a corporate sponsorship,” Randy Smith said in an exclusive, Standing Room Only interview. Most recently, (2013) Drew’s has also introduced several new lines including two all-natural dressings, (Chipotle Ranch and Thousand Islands) two new organic salsas (Organic Pineapple and Quinoa, Flax & Chia) and three new organic dressings (Goddess, Creamy Italian and Roasted Red Pepper). They also recently hosted a recipe contest as well. "We just finished exhibiting our products at the Natural Products Expo West held in Anaheim, CA in March," Hambright added. "This is an event in which natural and organic food companies from all over the U.S. and even some international locations, converge in one spot to allow retail store owners and managers a chance to evaluate products to offer for sale in their shops. "We met with many co-ops and natural independent retailers who form the backbone of our customer base. We also just introduced seven brand-new flavors for the first time in four years, including two new all-natural dressings, three organic dressings and two organic salsas… we are happy to say people loved them!" 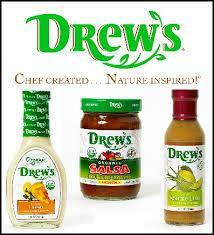 Drew’s products only use non-GMO ingredients and have no preservatives, artificial colors or artificial flavors. Their “organic” products are all-natural and also the ingredients from which they are made were grown without using pesticides or fertilizers. Drew's also offers many gluten-free, no-sugar-added and vegan products as well. Today, the company remains privately owned and employees some 30 people at their Chester facility. Since its inception nearly 20 years ago, Drew’s All Natural has grown to become one of the top three, shelf-stable salad dressing brands in the natural product industry and remains one of the fastest growing brands in the nation. To learn more about and order product from Drew’s All Natural, please visit their website at www.chefdrew.com.